As Fabrication Engineering Supervisor at Vitex, Micah Shaw loves a new challenge. 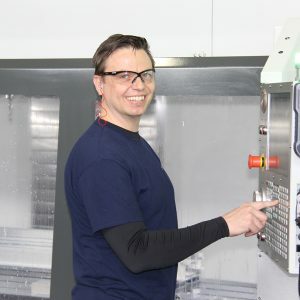 On any given day, he is busy working up estimates, readying machinery for new projects, and helping customers improve manufacturability of their designs. His extrusion design knowledge and CNC machining and fabrication experience make him an invaluable part of our production team. Tell us how you came to work for Vitex and what it has been like? I found Vitex on Indeed.com, back in 2016. They were looking for a CNC Operator. After meeting some of the employees and seeing the facility, I knew I’d found a place where my experience could be put to work, and I’d have the opportunity to learn new skills. I started as a CNC Setup & Operator. After mastering new equipment, learning new skills, and demonstrating I was a hard worker, I was promoted to 2nd Shift Fabrication Supervisor. I moved into the Fabrication Engineering Supervisor role in 2017. We always have new projects coming in, and each project is an opportunity to learn something new. I also work with a great team. When a new project comes together and is executed well there are a lot of high fives and fist bumps. I love that. What are some of your responsibilities as a Fabrication Engineering Supervisor? I’m responsible for how parts are produced. When a request for quote comes in, I help provide the cost estimate. This involves deciding what equipment and processes to use, if any special tooling and fixturing are needed, and estimating the new parts’ cycle times. Once the new job arrives, I’m responsible for bringing the necessary processes online and ensuring our actual production meets or exceeds the cost target we quoted, while also maintaining the level of quality our customers require. I also work to improve existing part production, finding ways to reduce production time and save our customers money. From time to time, I also communicate with our customers when they have questions about quality or our manufacturing processes, or how they can improve the manufacturability of their design to bring their cost down. What training or special skills are needed for your job? My CNC machining and programming background are used often. In the office, I use SolidWorks CAD and CamWorks CAM software to review designs. Tell us about a favorite project you worked on? We were producing a complicated part for the automation industry with a combined cycle time of 2 1/2 hours. With some specialty tooling and new CNC fixtures and programming, the same part is now machined in 56 minutes. New hires should learn as much as they possibly can about our machines, processes, and the special relationships we enjoy with our customers. A willing attitude goes a long way. At Vitex, everyone is ready and willing to help so don’t be afraid to ask questions, or volunteer to learn a job that looks interesting. What are your thoughts on working in the manufacturing industry? The manufacturing industry is alive and thriving. We need a continuous influx of talented people to keep it that way. As long as we have people designing, inventing, and creating new products, manufacturing will have a key place in our society. Micah Shaw reviews a machined aluminum extrusion with CNC Operator Frank “Buddy” White.